Pressed fruit & turmeric root juice shot, with black pepper. 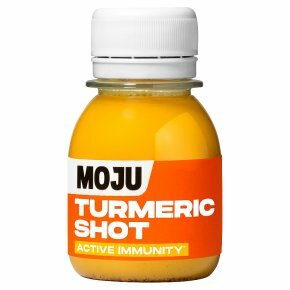 20g of raw turmeric root in every bottle. No added sugar. Nothing artificial. No preservatives. Cold-pressed. Fully recyclable packaging. Vegan. Turmeric is modern-day armour. One of nature's most potent herbs, it's been used for centuries in traditional medicine and is now a focus for clinical research. Black pepper goes hand in hand, helping with the full absorption of beneficial compounds in turmeric. With a pungent aroma and a bitter flavour, it gives the nervous system a kick for daily protection against life's curveballs.